aside	Illustrator, animator and writer Andreea Stan says art saves lives “There were situations when I felt that my art was the only thing I had and it kept me going, it didn’t let me give up”. Artist Andreea Stan – Photography by Sam Gyang. Andreea Stan, 25, from Southampton, UK is an animator, illustrator and writer. Andreea remembers using her brother’s pens and watercolors and drawing for hours and hours even before she started going to school. However she can’t remember how or when exactly she started drawing. According to Andreea’s mum when she was very little Andreea used to dip her fingers into food (especially red food like strawberry jam, or watermelon juice) and then draw on the white kitchen cupboards. Andreea never stopped drawing, however she only began to think of herself as an artist after she started university, when she was 21. Andreea studied animation and after graduation she started to combine illustration with animation and writing. I think communication is essential in each and every human interaction. Without communication we cannot make any connection with people around us. But what I find the most interesting and exciting about it is that it comes in so many forms and in each form we can find endless depths of meaning. Just thinking of the infinite ways in which silence can be interpreted is mind blowing. The subject of her submission for this issue of the ASLI magazine is on Communication and mental health. It might sound funny, but my creating process involves a lot of staring at a wall, which in other words might be described as taking time for reflection. We all have busy lives and there are so many different new situation that we find ourselves in every day. The material for art work is there, it just needs to be processed. So when I stare at a wall, usually listening to music, I think of situations which impressed me, in a positive or negative way, and which made me want to freeze them in time through art work. Then somehow ideas come (I don’t think anybody can really explain how, it is really a miracle!) and I put them on paper. Sometimes it is first an illustration that inspires a piece of writing, sometimes it is the other way around. A read and listen to music a lot, so I’d say that writers and musicians have a bigger influence on my work than any visual artist. The outsiders. The people who stand out and who are not afraid of that. The honest people and the kind ones. But most of all, the ones who have a passion and fight for it, fearlessly. I don’t think there are any causes in particular that I campaign for, but I will always support and encourage people in which I can see what I call a ‘spark’, in which I can see the potential to do incredible work. Also, through my art work I hope to be able to encourage people to speak more about subjects that are considered taboo, for example domestic violence, because the fear of approaching a taboo topics is the fear of the thing in itself. By talking about it I think one can overcome his/her fear. ‘Art creates change’ means, to me, that it is easier to change society through art than, for example, through politics. If you look back in time, the world changed at the same time with the arts. Just looking at, for example, The Beatles, at how they inspired and continue to inspire generations of musicians. Also, their music succeeds in promoting peace and love more than any street manifestation. 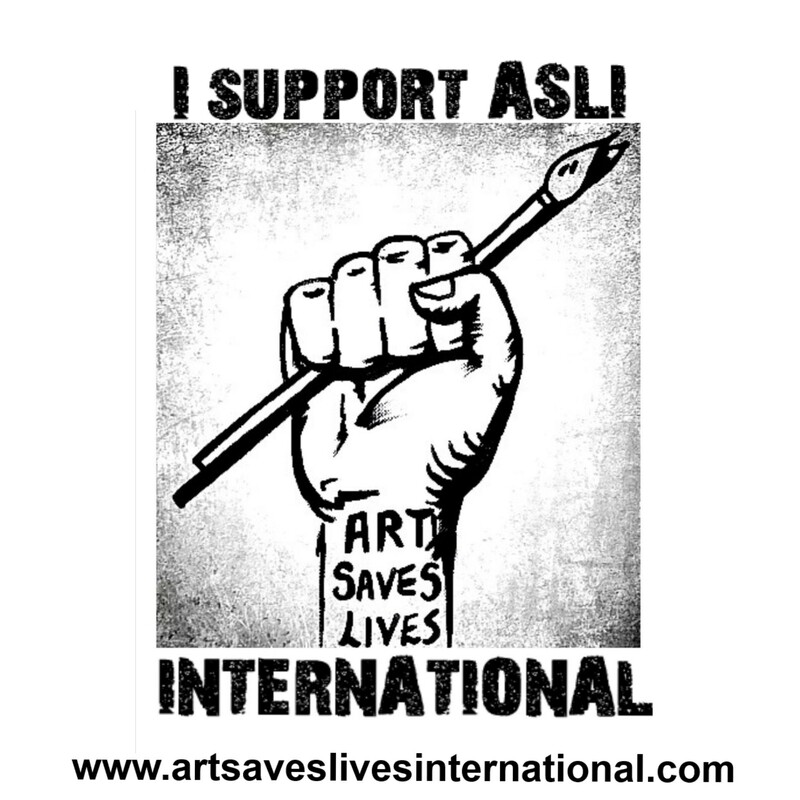 I take the statement ‘art saves lives’ quite personally. There were situations when I felt that my art was the only thing I had and it kept me going, it didn’t let me give up. My artwork was often a way of expressing my feeling when words failed in helping me do that and when there was nobody there to listen (situations which, I am sure, we all found ourselves in, at least once). I don’t know if I am the best one to say if the messages I send through my artwork can create change… I think there is still plenty of room for me to develop as an artist until I will be able to say with confidence that my art can help create a change in the world. It might make a change for one or two people, but at a large scale I don’t think so, not yet. I just hope to never stop creating and to keep my artwork true to myself. Andreea took part in our local pop-up exhibition to raise awareness about mental illness and the benefits of art. Here are the pieces which Andreea put into the show. I have witnessed friends struggling with depression before and after they were even aware that they were suffering from depression. My artwork helps me maintain a balance. Negative thoughts and emotions are often left on paper and they don’t affect my every day activities. Also, art is a way I define myself as a human being. Not doing art would mean to me living a life that is not mine, a fake one. I have seen people being marginalised due to their mental health, by people who didn’t understand their struggle. And often nobody understood their struggle because they were not aware that they were affected by a mental illness. I also saw people being stigmatised but then managing to change the situation by explaining what living with a mental illness is like. To be honest, I never seen anybody being marginalised despite their effort to explain their situation. Talking about a problem makes a problem easier to deal with. No, I’ve never received treatment for mental health. I think both society and culture are more accepting than before, but people with mental illness still face many challenges in society. Yes, definitely. It is often so much easier to express feelings through art than verbally, because art is open to so many interpretations that it makes people feel protected. Through art people are equally hiding and revealing their thoughts and emotions. It is probably the best way. I say that because I saw people’s reaction when they found out that some of the artists they admired struggled with a mental illness. Art opened doors to their feelings and struggles for people to see them. I loved the efforts made by ASLI to cast some light onto an area that is often seen as quite dark. Also, I wanted to know more about how art can be used as therapy. Do you believe in more rights for mentally ill people in the work place and for equal opportunities? Yes, and for that there should be more awareness that often a mental illness can affect work just as much as a physical injury. I think diagnosis labels are a way of acknowledging an illness and it suggests that there is a cure for it, or a way to make life function around it. I’m afraid that I don’t know for sure of any artists that I admire if they suffer from a mental illness or not. I often heard that love and war are similar, because they always find a way. I think art is the same, it always finds a way. Previous Denny Reader talks to ASLI about his schizophrenia and using his creativity, saying “Its gives me a purpose and a platform to share my ideas and myself with the world around me”. Next Visual Artist Mark Lloyd says “Art can provide an avenue for self-expression, Art can enable us to realise the truth, art can provide hope and wonder, elements that can provoke change and save lives”.